It’s River of Raptor season in Costa Rica. 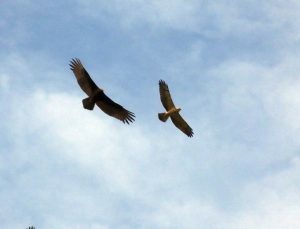 Find the flow of birds and thousands of TVs, Broad-wings, and Swainson’s Hawks can stream overhead. Lately, Swainson’s have been passing through in force, the other day, dozens flapped and soared just above the road during the late afternoon. Perfect, close views, a shame we couldn’t stop for pictures. There must have been a hundred and nearby cell towers were decked with TVs and hawks going to roost. This picture is from another moment during the River of Raptors. 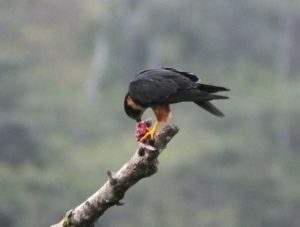 Widespread but uncommon, these beautiful little falcons always merit admiration. I have seen several in different sites, usually in pairs and perched on snags. The male of the pair at Virgen del Socorro was eating what seemed to be a swift. Other than the River of Raptors, we don’t see a lot but the other day, a fair number did show while I was driving including Crested Caracara, Short-tailed and Gray Hawks, Zone-tailed Hawk, White-tailed Kite, and a Hook-billed Kite along with the usual TVs and BVs. As we drove near Dave and Dave’s in Sarapiqui, a pair of beautiful and endangered Great Green Macaws flew in front of us. If the weather and timing are right, interesting birds can appear during a drive. They perch on roadside wires, snags, and tree tops. During a recent cloudy afternoon, I had dozens of parakeets and parrots flying to roosting sites as the two large toucans perched in the tips of trees. A chachalaca flew over the road, the silhouette of a Crested Guan appeared in a tree, and I saw a couple of Gartered Trogons and one Collared Aracari perched on wires. 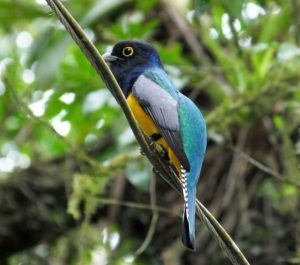 Beautiful Gartered Trogons sometimes perch on roadside wires in Costa Rica. This being migrant season, a birder can also run into huge flights of swallows and Chimney Swifts. They might not be as exciting as resident species but watching hundreds of small birds flying overhead in a constant, non-stop aerial stream is always a gift. 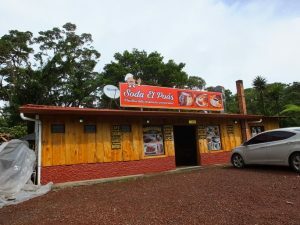 Take Route 126 through the Poas and Varablanca area and a birder can have lunch or a drink or snack at more than one stop with hummingbird and fruit feeders. Birds can also be seen in adjacent habitat. I plan on checking out this stop- it backs up to cloud forest and has hummingbird feeders. I hope to pay a visit within the next few days. These are some of the birds I have recently seen while not really birding. You see a heck of a lot more while actually stopping and walking around with binoculars at the ready. I would love to help plan your trip, contact me at information@birdingcraft.com. Spaces are still open on itineraries in 2019 with fantastic birding guided and organized by local experts for very good prices!